DURING my brief ten minute intro to all things blogging at the Venture Business Club last week I highlighted how a business owner could comment on new rules and regulations and their impact on its operations. I said it was an effective way of showing you have your finger on the pulse of things, as well as provides a way for other sites and journalists to stay in touch with your articles that may see you placed in front of their readers as well. On the internet side of things I said blogs were search engine magnets as the structure of a site is link and text based, which helps search spiders quickly work out what a new article is about and it would appear Google, and by definition others, are keen to index sites ever quicker, see Google Indexing Many Web Pages in Real-Time. IF you have got a favourite blog based around Manchester then make sure it gets its place in the spotlight. 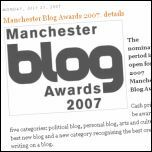 Kate Feld is drawing together nominations for the Manchester Blog Awards 2007 so head over to her Manchizzle site to find out more. Cash prizes will be awarded in five categories: political blog, personal blog, arts and culture blog, best new blog and a new category recognising the best creative writing on a blog. And the award ceremony will take place at Moho Live, on Oldham Street, starting at 7pm on Wednesday, October 10. I WOULD struggle to work in an office after tasting the self-employed life, but one thing that you can miss out on is the exchange of ideas and new possibilities. Although online community websites can help, there is still something about chatting over a pint and a few nibbles, so that is one of the reasons why I went along to a networking event in Altrincham last night hosted by the Venture Business Club. I WAS at Platt Fields in Manchester last night marking quatorze juillet and watched the crowds enjoy the Bal Enchanté, some photos and a video clip of the evening are on This French Life. CHARLIE Beckett, the director of Polis, a journalism and society think-tank, highlights an excellent piece in The Times that looks into the work being done to tackle radicalism within Muslim communities. He concludes that quality reporting is important, but also that efforts should be made so that people are able to access tools to enable clear communication about life in Britain. His post comes at a time when the talk of local news and community led initiatives raises its head once more, led by Jeff Jarvis. THE gentle tap, tap, tap of lap top keyboards was joined by the music of Europe as BBC Manchester staged another of its blogger meet-ups last night. I COULD have categorised this piece under Business, Advertising, Citizen Journalism, Blogging and maybe a few others from my list - but I ended up sticking with Citizen Journalism. Jeff Jarvis has written a piece on the challenges of running local websites following the demise of US-based initiative Backfence.com. And it is that challenge of bringing together so many strands that faces such sites, because really the different elements can't even be running under one site or a collection of similar sites owned by the same group. I HAVE just spent far too long looking through a load of TypePad themes you can plug into your site if you are using the Pro account - take a look at The Style Archive. If you have experience of using Advanced Templates then it shouldn't take too long to give your site a different look, and if you want the full step-by-step instructions check out this TypePad Support page. BBC correspondent Alan Johnston has been released by kidnappers in the Gaza Strip after 114 days in captivity. Mr Johnston, 45, was handed over to armed men in Gaza City. He said his ordeal was like "being buried alive" but it was "fantastic" to be free. I HAVE written in the past about the online endeavours of Rick Waghorn who once covered the exploits of Norwich City Football Club for his local newspaper, before striking out to start his own site. Well it would appear his My Football Writer project is beginning to gather steam with a new website now up and running and news that he is on the look out for journalists. Talking of former journalists heading out onto the internet to start new projects, Colin Randall is already getting his Salut Sunderland website ready for the new season. And with all this entrepreneurial endeavour knocking around you might want to drop in on Rachel Elnaugh's new site. The former Dragons' Den pundit has got off to a good start with a number of entertaining articles and she has clearly enjoyed getting her teeth into Peter Jones' new show. I hope Rachel keeps writing.